Melanoma is a skin cancer. It is among the least common forms of skin cancer, but it is also the deadliest of them all since it can easily spread to other parts of your body. Every year, about 76,000 people get affected with melanoma and about 10,000 fail to survive. Children and teens are the most affected groups. Early diagnosis improves your chances of recovering from this type of cancer. Keep reading to find some melanoma pictures to understand how to confirm if you have this condition. It is not uncommon to have spots on your skin, but you need to check if it changes with time or not. The most important sign of melanoma is that it will change its shape, size, and color over time. What's melanoma like? 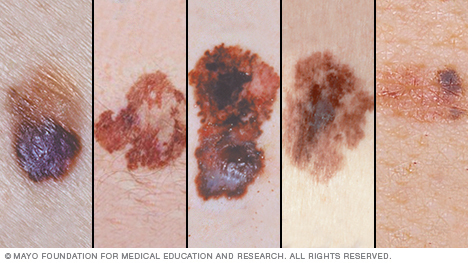 Here are some melanoma pictures for you to refer to. If you notice any abnormal spots on your skin, see your doctor to have a check. The features of melanoma can be concluded below. A symmetrical mole has the same edges on each side, but the two sides do not match in an asymmetrical mole, which indicates that cells on one side of the mole are growing faster than on the other side. This usually indicates cancerous growth. Pay attention to the edges of the mole you have on your skin. If it has a clear, well-defined shape, it is probably a normal mole. The mole is more likely to be cancerous if its border seems fuzzy. Blurred or ragged edges usually indicate uncontrolled cell growth of cancer. Your mole can be of black, brown, or tan in color. You do not need to worry much if the color is solid throughout the mole. It may be cancerous if you notice a combination of colors in the same mole. A melanoma is more likely to have splotches of different colors such as gray, white, blue, or red. A normal mole can be up to 6 mm in diameter but cancerous moles can be bigger than this. Normal moles do not change their size over time, so you need to talk to your doctor if your mole is growing in size. See your doctor immediately if you have a spot on your skin that continues to evolve and change its size, color and shape. Now that you know "what does melanoma look like",it is equally important to learn what treatment options are available for this skin condition. It is important to remove lymph nodes if melanoma has spread to it. You may have to undergo additional treatments before and after your surgery. The procedure involves giving certain medications intravenously to destroy cancer cells. You can receive chemotherapy in various forms: taking pills, getting intravenous infusion or both. The procedure involves using high-powered energy beans to kill cancer cells. Your doctor may order radiation therapy after they have removed the lymph nodes. The therapy helps improve your immune system to boost your body's ability to fight cancer. Your doctor may choose interleukin-2, interferon, pembrolizumab, or nivolumab for these therapies. These treatments may have some side effects, such as fatigue, chills, headaches, fever, and muscle aches. Your doctor will use specific medications to target specific vulnerabilities in cancer cells. Some of the side effects of these therapies are fever, dehydration, chills, and skin problems. Dabrafenib, vemurafenib, and trametinib are the most common drugs used for targeted therapy. What About the Survival Rate of Melanoma? Early diagnosis improves your chances of survival. This is why you should not shy away from asking "what does melanoma look like". In most cases, people manage to survive after their initial surgery. There is a 91% of five-year survival rate for people with melanoma; however, the ten-year survival rate falls to 89%. So many factors go into determining your survival rate. The thickness of the melanoma, the involvement of lymph nodes, and the severity of melanoma are some of them. If melanoma is still restricted to the area where it started, it is early-stage melanoma and there are 98% chances that you will survive. The five-year survival rate drops considerably to 63% when lymph nodes are also involved. Avoid direct exposure to the sun, especially from 10 am to 4 pm. Wear appropriate clothes to protect your skin from UV rays and wear a wide-brimmed hat to shade your neck, face, and ears. Make use of a high quality sunscreen for protection. Select a sunscreen with SPF of at least 30. Avoid using tanning beds, sun lamps, or tanning salons as much as possible. Examine your skin regularly and talk to your healthcare provider if you notice any change. What Causes That Dark Ring Around Neck?